James Hodgson and Geoffrey McKay have become the newest members of Walton Chapter No 1086, in a dignified and sincere enhanced exaltation ceremony. James Hodgson (left) and Geoffrey McKay. The chapter was opened in the usual manner by the three principals, Barry Harnick first principal, George Strickland second principal and Colin Graham third principal. Once the initial business of the chapter had been conducted, Barry asked Paul McLachlan to occupy the first principal’s chair for the exhalation ceremony. Paul then asked Eric Palfreyman to retire and entrust the candidates. Eric re-entered the chapter with the candidates and the ceremony proceeded. 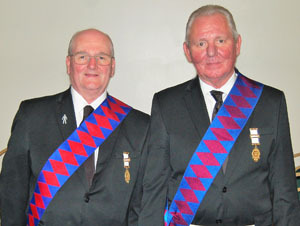 At the end of the ceremony, James and Geoffrey were placed in the west of the chapter room. Chapter DC Stephen Lynch then gave a flawless explanation of the signs. The ceremony of exaltation being completed, the three principals congratulated James and Geoffrey and welcomed them formally into the chapter and hoping they would have many happy years of companionship in the chapter. After the remaining business of the evening was completed, the chapter was closed and the companions retired to the festive board for a very enjoyable meal. Pictured from left to right, are: George Strickland, James Hodgson, Paul McLachlan, Geoffrey McKay and Colin Graham.